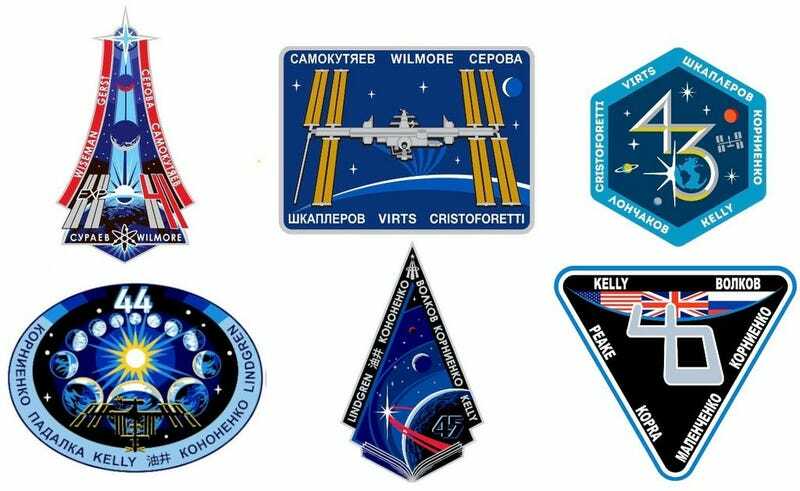 Here are the patches for next six expeditions of the International Space Station, Expeditions 41 through 46. If you look closely you'll notice that the names Kelly and Kornienko (in Cyrillic script) on the patches for Expeditions 43 to 46. That's because Scott Kelly and Mikhail Kornienko will be participating in a one year mission on the ISS. While the Russians have already conducted long duration space flights of a year or more, this will be a first for a NASA astronaut. Even though Scott Kelly's twin (and retired astronaut) Mark won't be kept in a controlled environment, NASA will still observe and test both brothers during and after the mission to compare data. Expedition 41 is scheduled to launch later this month on September 25 with the first female Russian cosmonaut to travel to the ISS (and fourth female Russian cosmonaut overall).